SMART Centre Market opened its doors in 2010 to encourage students’ interest in science. A delightful Science Centre Market exists in downtown Wheeling, WV – right next door to their historic Centre Market District. This is no ordinary shop as it combines elements of hands-on experience, museum-like pieces, as well as a place to find some unusual gift ideas for those interested in science. Libby and Robert Strong enjoy having fun as well as teaching. It seemed the natural thing to do for a physicist and a biologist! This cast shows the armored skeleton of a German fish with teeth sharp enough to bite through the shells of squid. A fossil is a snapshot in time, so they feel it important to have original fossils throughout the center. Since originals are hard to come by, some of the larger displays are casts of original fossils, so children can see their size and detail. It is important to keep past science discoveries alive. This wooden singing tree produced a beautiful song as a marble, made at near-by Marble King, dropped from leaf to leaf. Around every bend, there’s a spot for hands-on discovery. Robert pointed out that there are two kinds of people who enjoy their place: little kids and tall kids. Even adults need to keep their curiosity alive, and learn something new each day. This Gravity Well lets children watch a coin go around at high speeds as the coins descend to the vortex tunnel. This is the place to learn while you play. Children find interesting a line up of scales where they can discover their weight on earth, the moon, Mars, Jupiter, and Pluto. On Pluto, they would weigh the least, and on Jupiter the most – due to gravitational pull. A Gravity Well lets you watch different size coins make their way down the well at different speeds. Books on every scientific subject fill the shelves along with science kits to ignite their imagination. Besides all the activities in the center, the Strongs hold field trips, camps, workshops, and have special open evenings for star gazing. Their main desire is to create a place where kids can have fun learning about science. Robert and Libby bubble over with enthusiasm. This 1955 game of Wooly Willy shows the magic of magnets as it creates “Magnetic Personalities”. Everything in the center has an unusual quality. No matter where they sat or stood, the Strongs could point out unusual items such as dinosaur teeth, leaf fossils depicting global plate shifting, or pieces of k-t most likely from a million-year-old asteroid, which coincided with the extinction period of the dinosaurs. All this from one spot! The day had to be finished with an ice cream cone, which Robert handed to me upside down…and it didn’t fall out!.That’s the first time a physicist ever made me an ice cream cone and it only cost a dollar. This ice cream comes from Kirke’s Homemade Ice Cream at near-by St. Clairsville. With a visit to the SMART Centre Market, kids of any age can catch enthusiasm for the world of science. Robert and Libby are prepared to help you light the fire of exploration. Don’t forget the ice cream cone! Often a gravel country road leads to places that give us a better understanding of our country’s history. Sometimes the things we find along the way don’t look as important as they really are. Such is the case with one of the most significant landmarks in West Virginia, the Fairfax Stone located at Fairfax Stone Historical Monument Park near Thomas, WV. This stone marks the North headwaters of the Potomac River, which flows all the way to Virginia. Today the original stone is gone, but a replacement stone marks the spot so future generations will not forget how the states’ boundaries were determined. The reason for the search for the headwaters of the Potomac River came about because the King of England gave Thomas Fairfax all the land from the Potomac River to the Rappahannock River. Naturally, Lord Fairfax wanted to know where the boundaries of his land actually were. This was part of the Northern Neck Land Grant. The surveying for this western boundary of Maryland was done by Colonel Peter Jefferson, Thomas Jefferson’s father, and Thomas Lewis. Many historians say that George Washington perhaps set the original stone himself as a young surveyor. Way back in 1746, the original stone was placed there to honor a boundary dispute between Thomas Fairfax, 6th Lord Fairfield of Cameron and the English Privy Council.. Later it became the spot to mark the state boundary of West Virginia and Maryland. The dispute over the boundary between Maryland and Virginia, later West Virginia, was so severe that it ended by being solved by the Supreme Court. Now it is easy to see its importance. 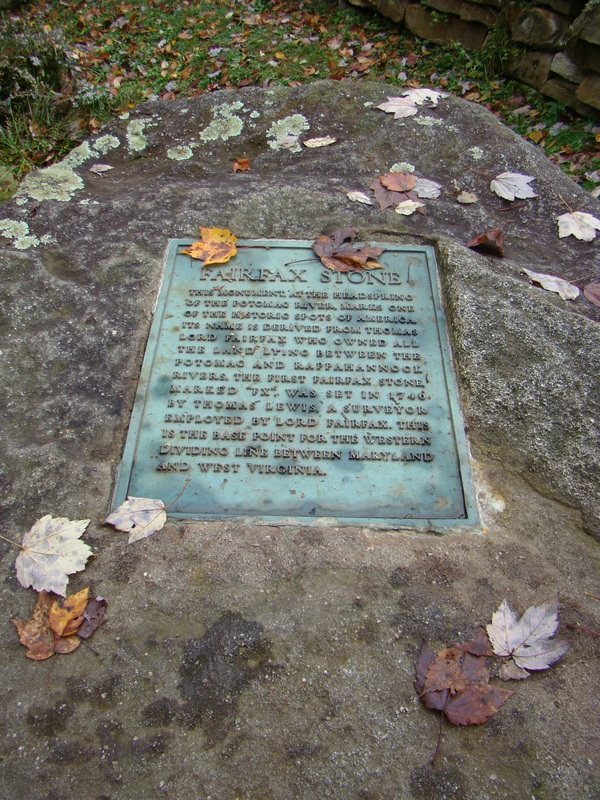 Fairfax Stone plaque describes its history. The original stone was a small pyramid of sandstone and had the letters “F.X.” scratched into the stone. Now an engraved six ton rock with a flat surface displaying an engraved metal plague sets over the site of the actual spring, the beginning of the North Branch of the Potomac River in West Virginia. An inscription on the plaque tells the historical significance of the stone. The marker from 1910 rests close by. Nearby Mountaineer Wind Energy Center generates electricity. 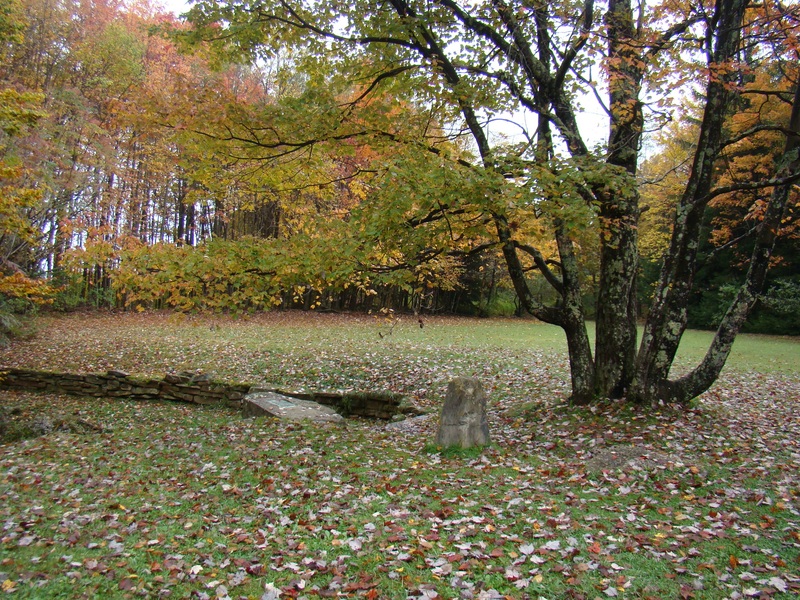 Even though this park contains only four acres, the Fairfax Stone Historical Monument Park attracts many historians, who want to walk where their forefathers trod. 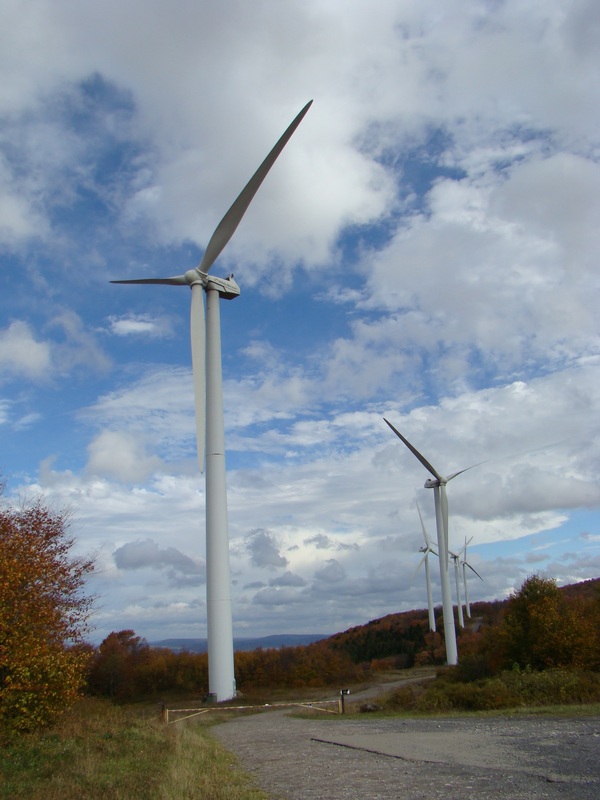 Then take a ride just south of here and view some modern history in the making – the Mountaineer Wind Energy Center, the largest wind farm east of the Mississippi that provides electricity to many of the mid-Atlantic states. Next time you take a drive, perhaps you will want to explore some of those dirt roads along the way. You may be surprised at what you find. 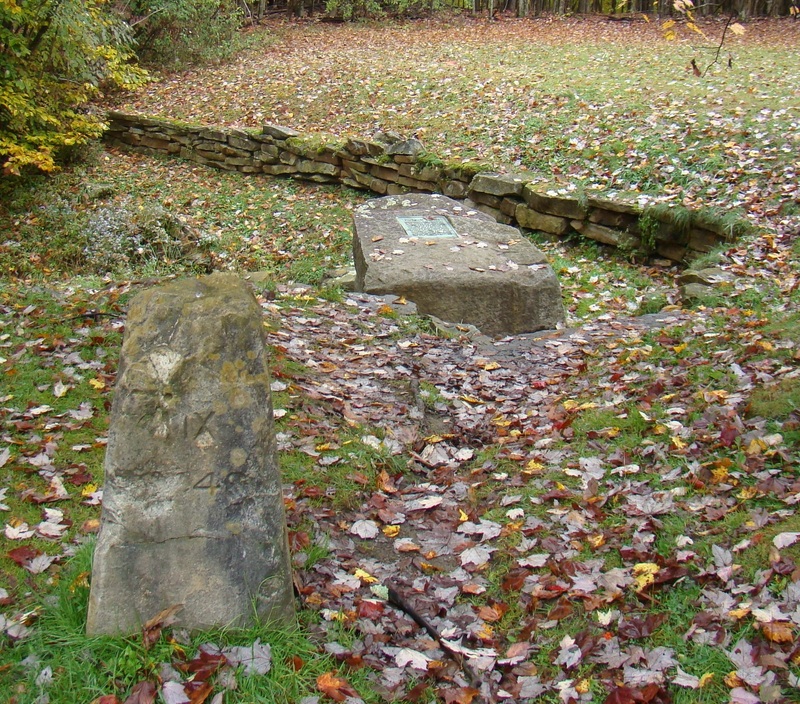 Fairfax Stone Historical Monument Park can be found off U.S. Route 219 near Thomas, WV. Turn onto county Route 9 and travel .5 miles. Turn right at Fairfax Stone Monument sign and travel 1.5 miles to Fairfax Stone. Great signs help make this easier to find. “The Rock with a View” describes a visit to Coopers Rock between Morgantown and Bruceton Mills in West Virginia, bordering Pennsylvania. The crowded park grounds gave a festival like appearance with beautiful American chestnut and stone picnic shelters welcoming families and groups to spend the day. 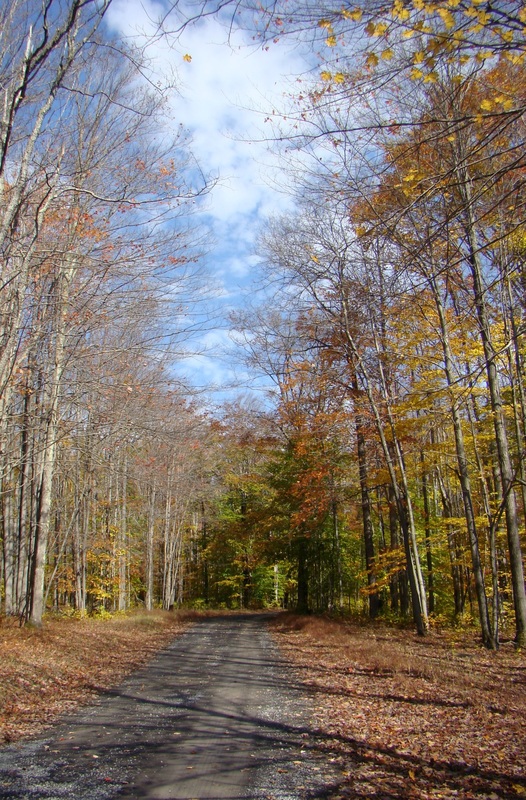 Fifty miles of hiking trails provide an outlet for exercise surrounded by nature. During the winter months, these trails are used for cross-country skiing. But the picnic area and hiking trails weren’t the attraction here. After walking down a short scenic path, you arrived at an immense rock, which serves as a scenic overlook for miles around. Caution must be used on this very steep and slippery rock. 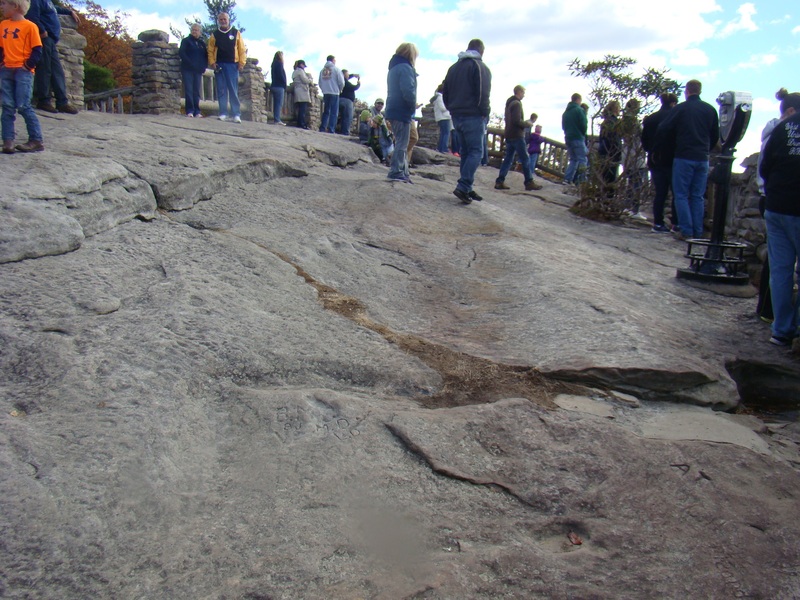 Climb cautiously on Coopers Rock. 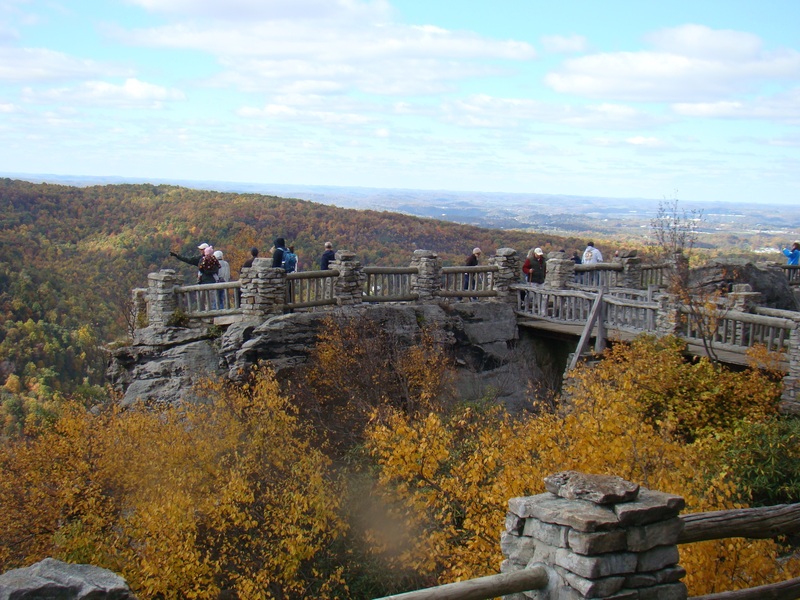 Legend has it that Coopers Rock received its name from a barrel maker, also called a cooper. The story goes that a fugitive hid away from the law for several years under the shelter of the rocks in this vicinity. In his new mountain hideaway, the cooper made barrels, which he sold to people in the nearby communities. The early history of the area centers around the iron ore industry, with many iron furnaces located nearby as early as 1798. With the discovery of iron ore and limestone, the abundance of hardwood trees for fuel made this the perfect spot for Henry Clay Iron Furnace, which produced pig iron. 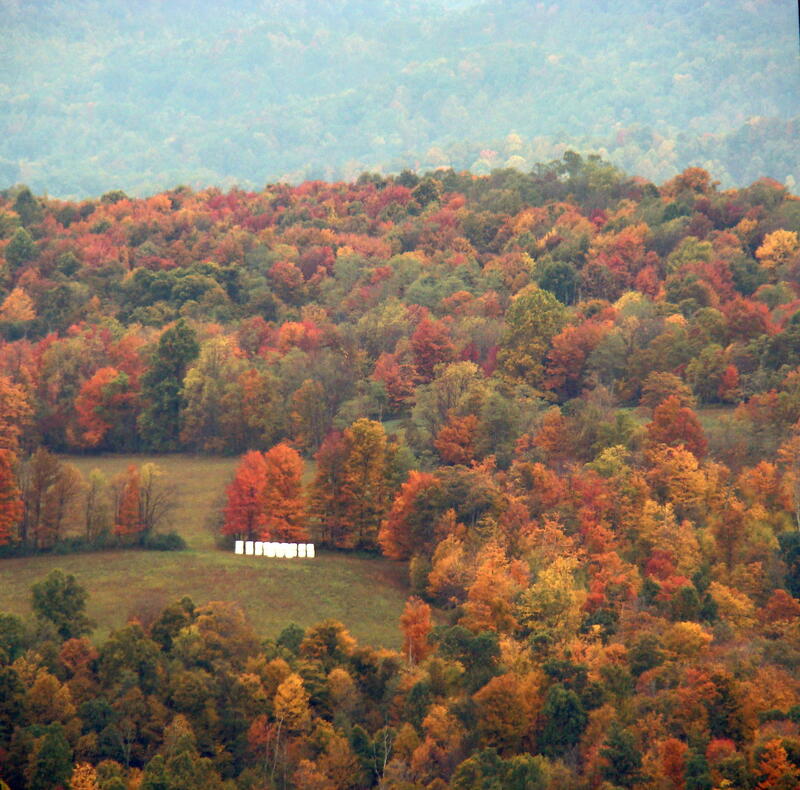 Standing on the Main Overlook, Cheat River Gorge appears in panoramic view. Fall is the perfect time to enjoy the scenic gorge and river surrounded by autumn colors. Enormous boulders and cliffs encourage rock climbers and hikers to explore. An astounding piece of work is the stone bridge which connects the overlook to the main ridge. 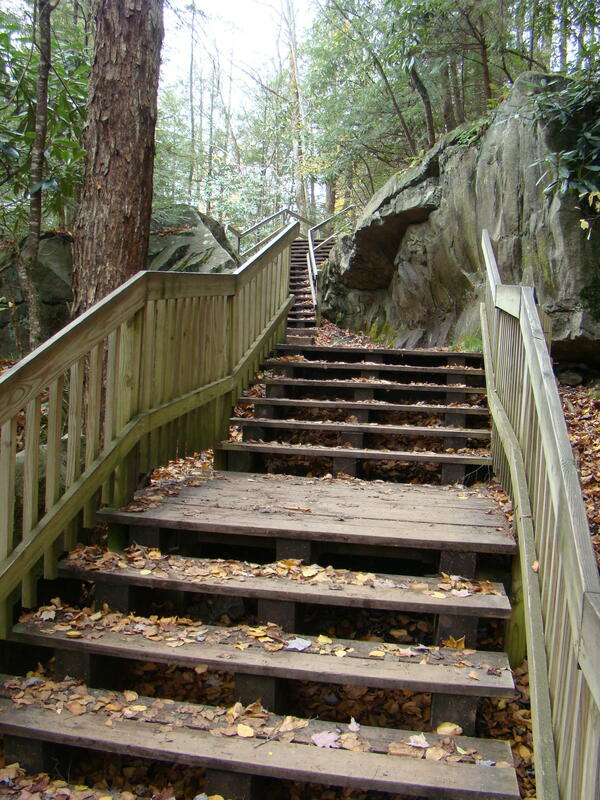 The steps were carved out of the mountain during the Great Depression by the Civilian Conservation Corps. The view from the bridge is quite spectacular as well. 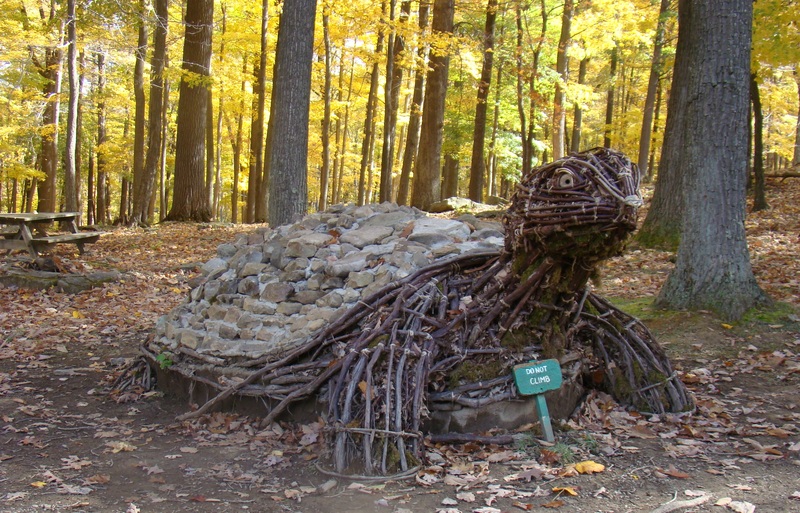 During the last few years on Earth Day, Benjamin Gazsi of West Virginia University made eco-sculptures near the parking lot of Coopers Rock to create another reason for people to visit. 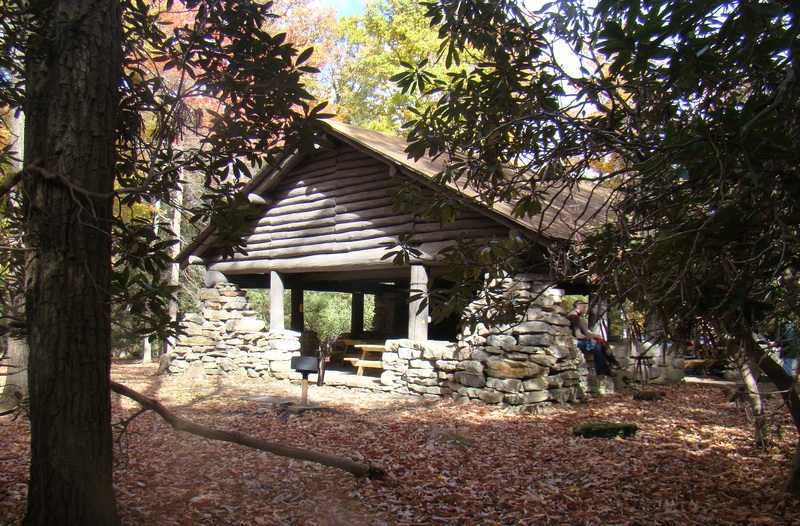 The Sleeping Giant, Standing Bear and Coopers Rock Turtle are the first three structures to be completed using products of the forest. These characters made of tree branches, mud, grass, leaves, and moss will be enjoyed by visitors until nature returns them to the forest floor. Access to the park is closed during December until March 31 for motor vehicles, but you can still park at the first lot and walk in. There is no charge for visiting and hiking this fantastic forest. Being in a peaceful spot surrounded by nature clears the mind and relaxes the body. Coopers Rock State Forest has easy access just east of Morgantown, WV from I-68 off Exit 15. I-68 actually bisects the State Forest into two areas. The roaring falls of Blackwater River can be heard for miles around. Located near Davis, West Virgnia, these falls have become one of the most photographed sites in the state. 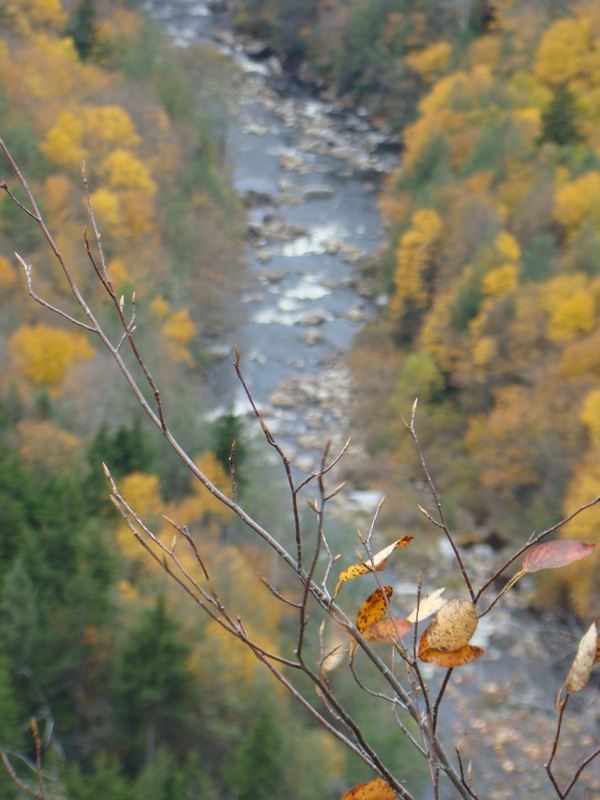 When you arrive at the Blackwater Falls sign, you notice that it says 214 steps to the falls. As you start down the first steps, it seems like an endless adventure as group after group of steps appear. Youngsters step gingerly down the steps, counting as they go to see if that number is actually correct. Several viewing platforms have been placed for enjoyable viewing, as well as a spot to rest. Mountain Laurel already produces blossoms for next spring. 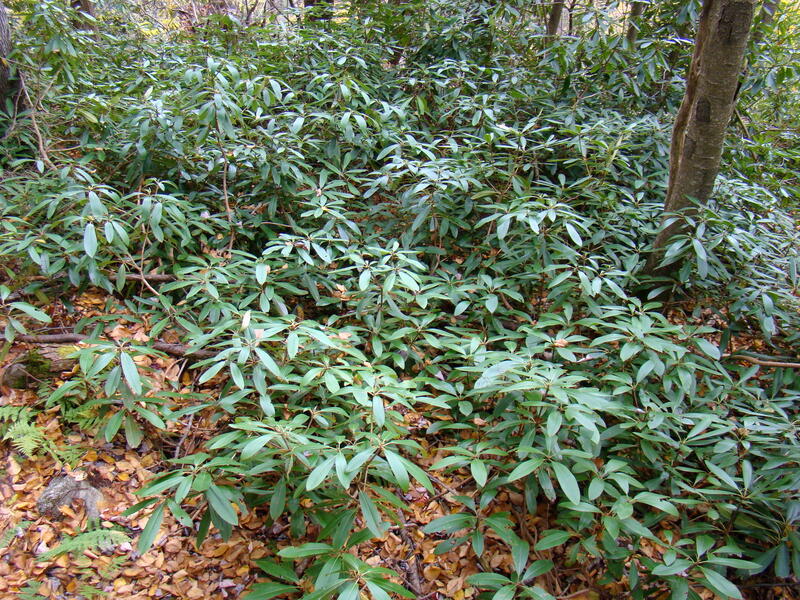 Along the way, the forest flourishes with mountain laurel plants, already forming blossoms for next season. In the fall, autumn leaves add color to the greenery of the pines. Posted signs give interesting, helpful information regarding the falls. One sign points out that the walls of the falls are composed of “Salt Sand” used by drillers. This Conoquenessing sandstone strongly resists forces of nature, and forms the canyon walls and Blackwater Falls. This special sand assists in the production of oil and natural gas in West Virginia. 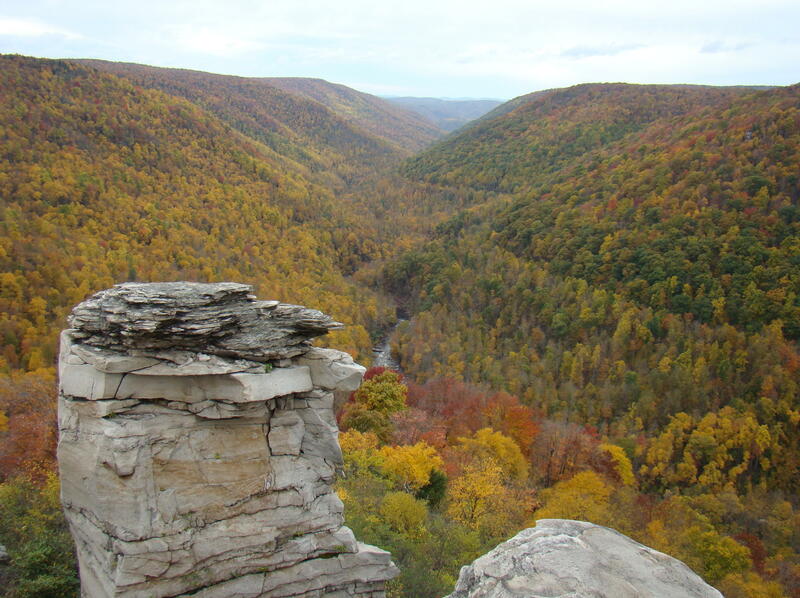 Sandstone began to form here over 230 million years ago as deposits of sediment were deposited in large basins that covered present day West Virginia. Over millions of years, most sediment deposits squeezed and changed the underlying sediment to rock. The large boulders at the base of the falls were once part of the cap rock. The first glimpse of the falls even from afar takes your breath away. When you get closer, you can actually feel the spray from the water on your face. As it descends the falls, the water appears amber, or tea colored as it plunges straight down about sixty feet before it twists and turns down the eight mile long gorge. Since the color appears darker than most waterfalls, it received the label of “black” water. The color results from tannic acid emitted by fallen hemlock and red spruce needles. As you watch the bubbling mountain stream at the top of the falls, it suddenly picks up life as it tumbles over the edge, swirling as it goes.But it’s pure pleasure to sit on the deck of the overlook and listen to the powerful sound of the falls with its unending flow. Sometimes during the year, the falls either slow down to a trickle, speed up to a torrent, or even partially freeze over. Everytime you visit will be a new experience! 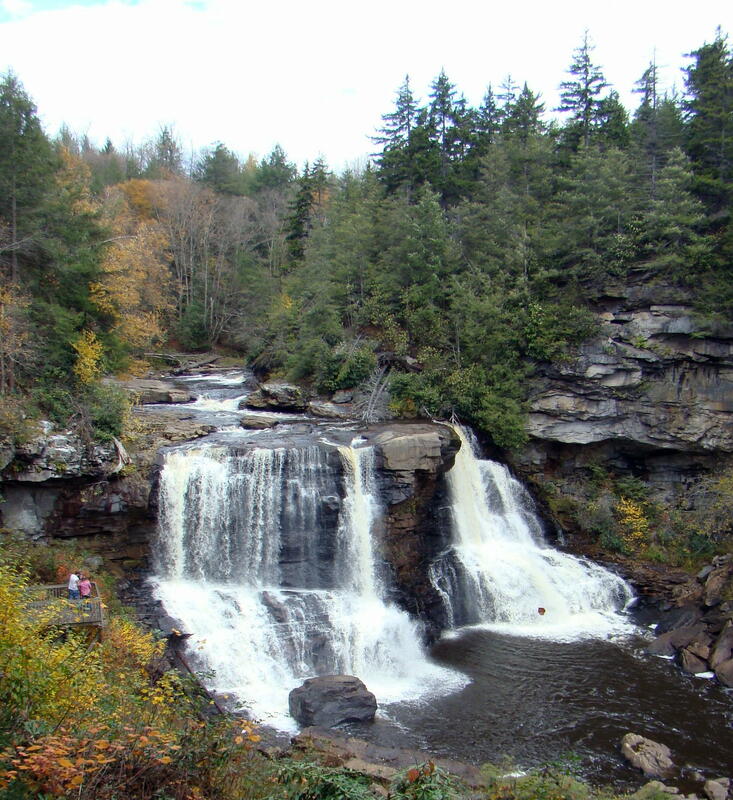 Blackwater Falls can be found in northeastern West Virginia near Davis. Natural treasures like this remain off the beaten path so directions vary greatly depending on your direction of travel. Definitely worth the trip! Listed as smallest church in 48 states, but that is debatable. On the backroads of West Virginia, a sign points to Our Lady of the Pines. 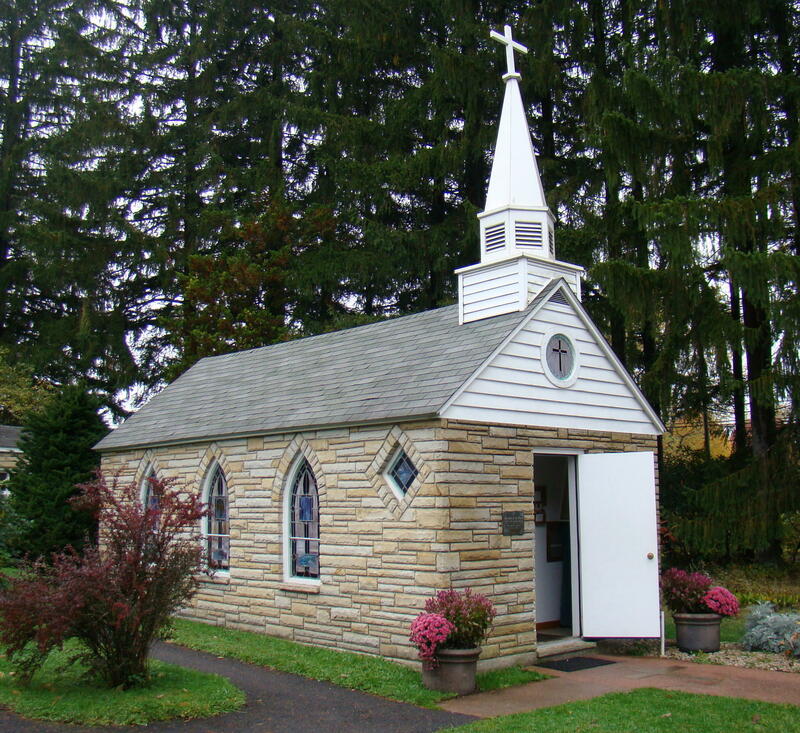 Established in 1968 near Thomas, WV, this church claims to be the smallest church in 48 states. Blessings from your visit will bring peace of mind as you travel on down the mountain highway. The community received its name from Silver Lake, a small man-made lake built in 1928 at the headwaters of the Youghiogheny River. Previously this town was known as Breedlove, the southern terminal at that time of the Preston Railroad. This tiny memorial Roman Catholic church was constructed in 1958 by Mr. and Mrs. P.L. Milkint in honor of their parents. This small piece of beauty was built completely out of love. The delightful stone church contains stained glass windows and an historic bell in the tower. Topped by a cross on its steeple, a second cross appears in the cement work of the sidewalk just outside the front door. 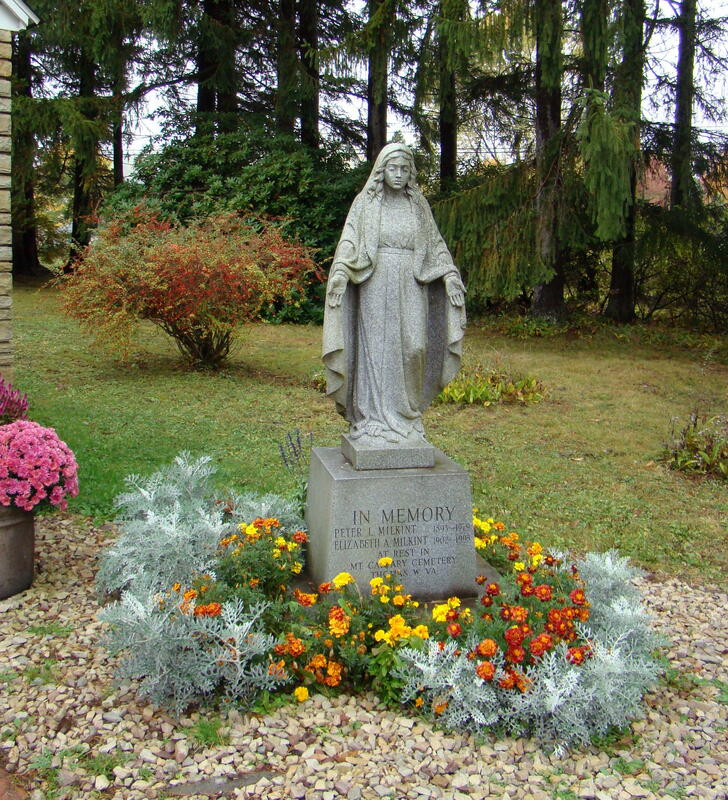 On their well kept lawn, beautiful flowers surround a memorial statue in front of the church. Mission priests come from time to time and hold mass in this little gem in the mountains. Many young couples have been married here as well. Often on a Sunday five to six hundred visitors leave here with a peaceful feeling. Inside six pews can seat 12 worshippers. Outside measurements are 24′ X 12′, while inside measurements are 16′ X 11′. 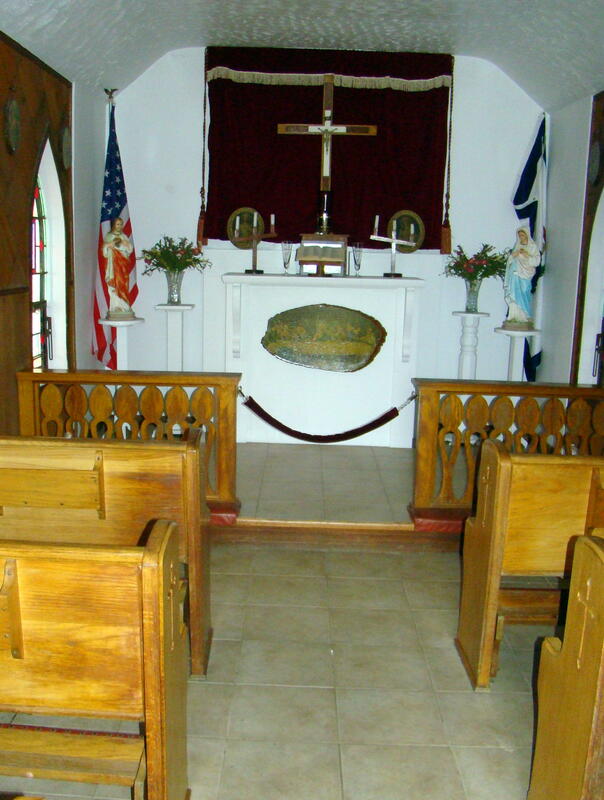 Even though the church claims to be the smallest church in the states, there are many other smallest churches listed around the country. If you know of a smaller church, please let me know. The beautiful altar area, cross above the altar, candleholders, and old rugged cross at the foot of the altar were all handmade with love. The infant of Prague with its red velvet garment was donated by a dear friend of the family. Their Lithuanian grandmother actually wove the altar cloth over ninety years ago in her home country. 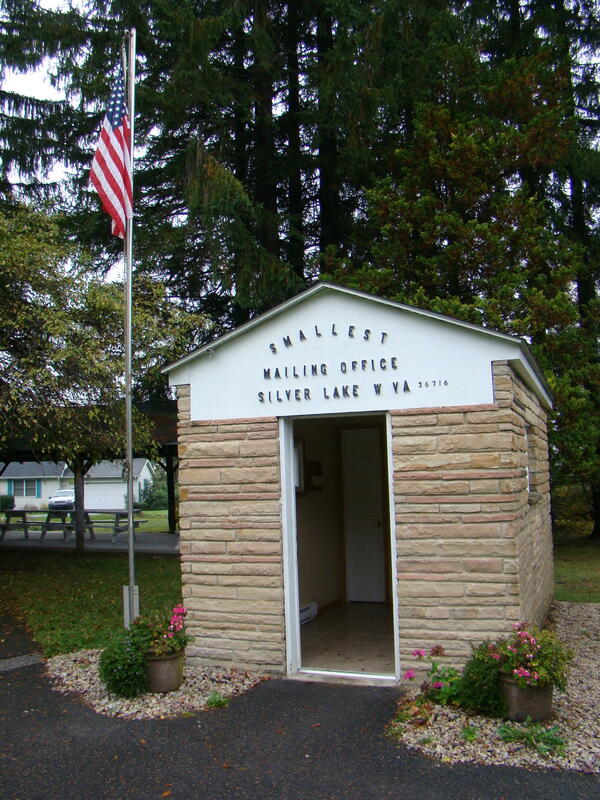 The church’s next door neighbor is the smallest mailing office – a post office serving the small rural community of Silver Lake, West Virginia 26716. 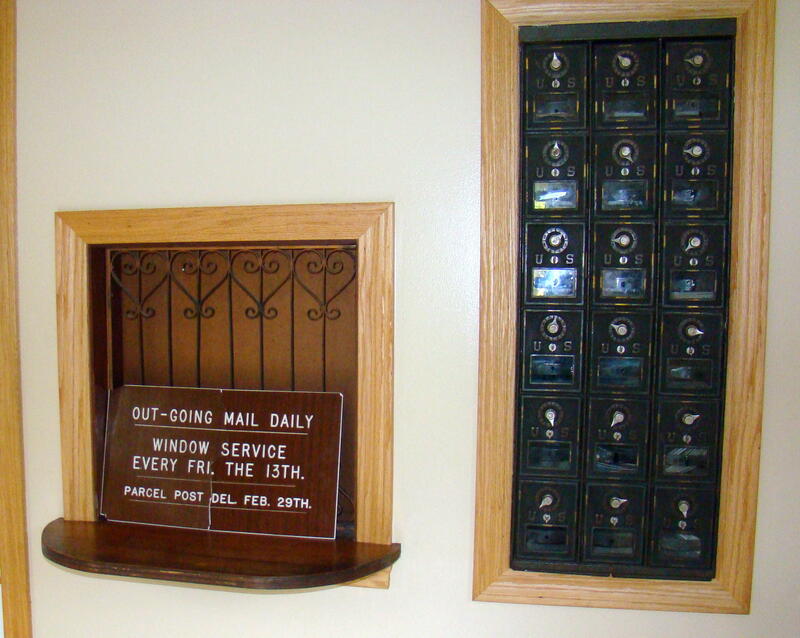 A sign inside tells that there is outgoing mail daily, but window service is only available on Friday 13th. Parcel post service is available on Feb 29th. It’s always a pleasure to see the Stars and Stripes flying, surrounded by more beautiful flowers. It seems they have planted flowers that bloom from spring through fall. This tiny church can be found just south of Deep Creek, MD along route 219 at Silver Lake, West Virginia on County Road 24/8. Enjoy the beautiful mountain roads along the way. 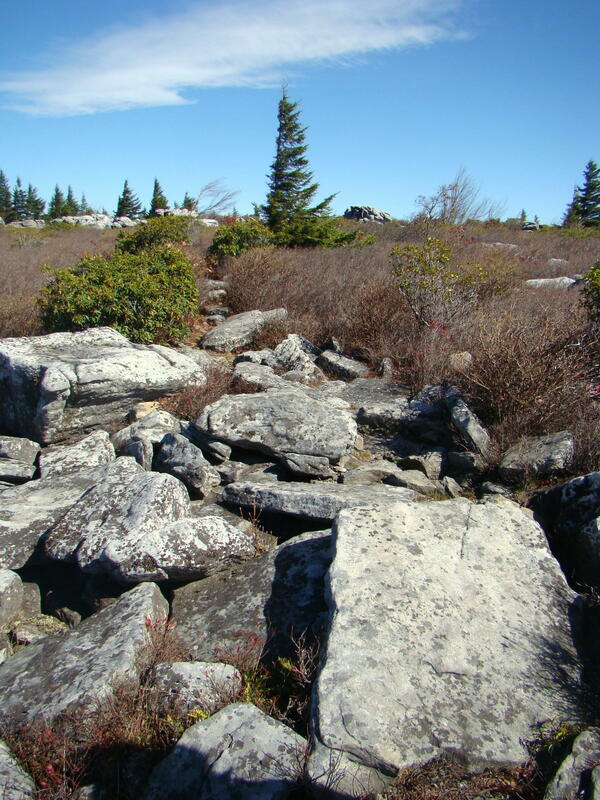 Desolate Dolly Sods – a perfect escape from civilization! Desolate! That seems the perfect description for the Dolly Sods Wilderness. This vast, rugged back country can be found in the Allegheny Mountains of West Virginia in the Monongahela National Forest. Named for a German family, the Dahles, locals added “sods”, because that is their term for an open mountaintop meadow where cattle grazed. 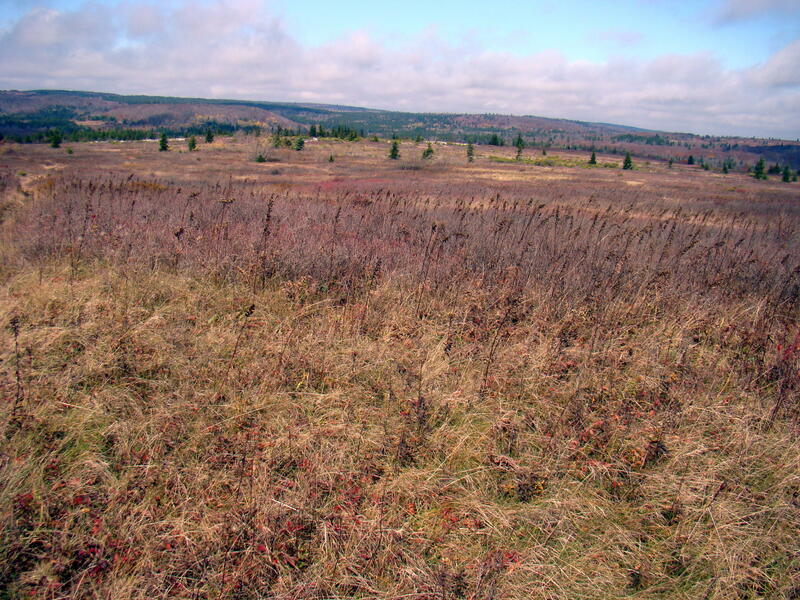 Over the years, the entire name has been localized to Dolly Sods. 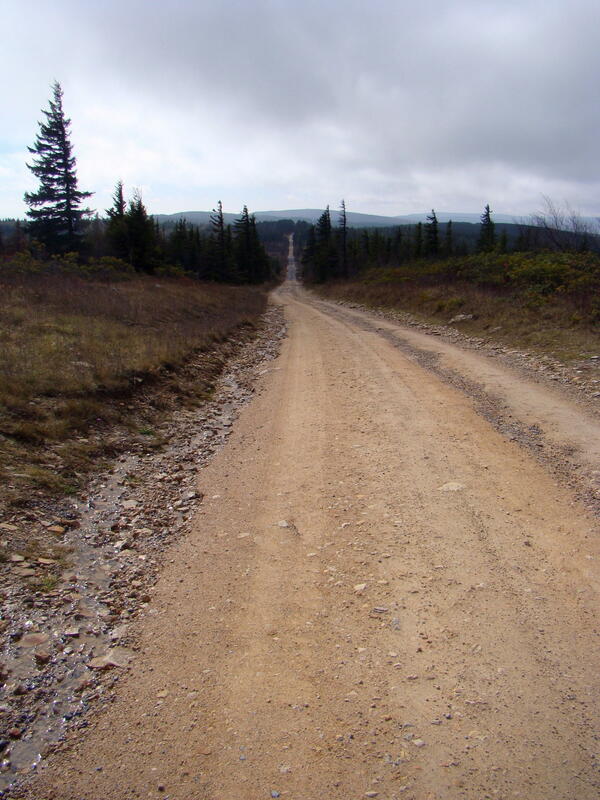 The road to the top contains narrow, twisting, dirt roads. You just hope you don’t meet anyone coming around the bend. Add a little fog to the adventure and the trip becomes even more exciting. As you enter the wilderness area, you might feel civilization is being left behind. No guardrails line the sides of this mountain road, but hopefully the trees would catch you if you had to get close to the edge. Flexible weather can change several times in a day. Within an hour, sun, rain, snow, and fog might all make an appearance. Cool weather prevails and frost can occur on any time of the year. But that doesn’t deter the campers, who camp out year round. Winds blow fiercely here as witnessed by the red spruce trees, whose branches grow on one side, the side away from the wind. During the early 1900’s this mountain top was a great source of timber for the United States. At that time, some of the trees measured 13′ in diameter – quite the giants! Those early settlers cleared the field completely of all growth and brush. Sparks from the locomotives, saw mills, and logger’s warming fires set fire to the field to burn everything off; the peat burned for years as it was seven to nine feet deep. 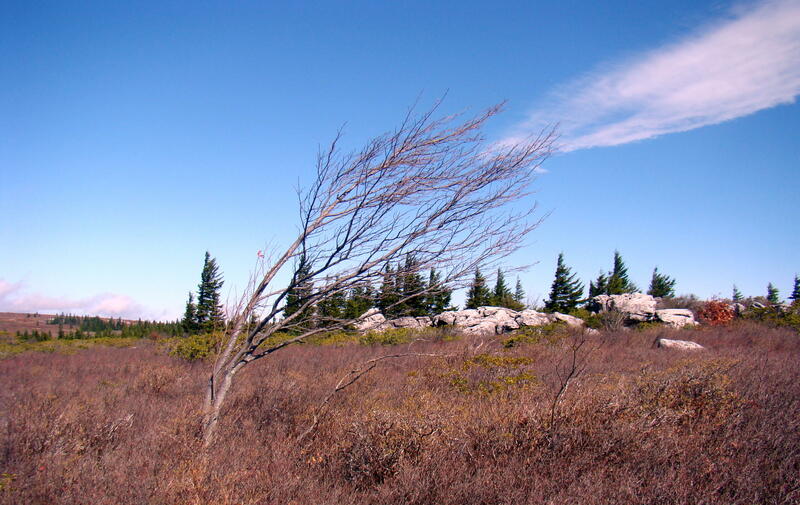 Today, little growth remains on the top of the Dolly Sods, but a new crop of trees is growing at lower levels. 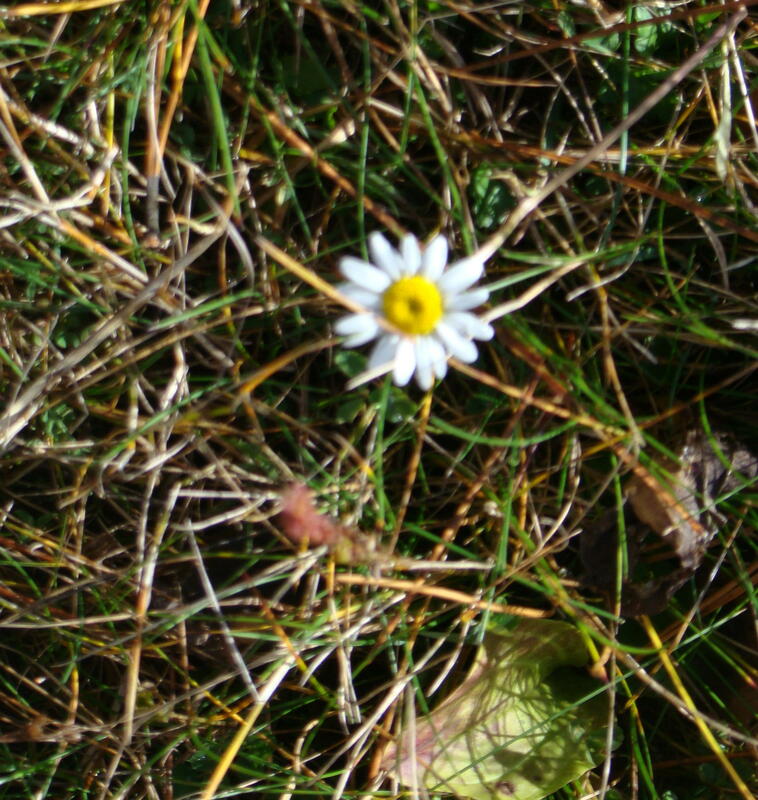 Right now this high plateau can best be described as a vast “nothingness”, but low growing blueberry and huckleberry bushes, wild strawberry plants and even a daisy can be found struggling for existence. Many trails exist to explore the wilderness and you don’t have to worry about reptiles as they don’t want to hang around in the cold. When you finally get to the top, rocks and low growth cover the open areas. Over 17,000 acres compose this arctic-like, wilderness area, which runs about 49 miles across the top. …so savage and inaccessible that it has rarely been penetrated even by the most adventurous. The settlers on its borders speak of it with a sort of dread, and regard it as an ill-omened region, filled with bears, panthers, impassable laurel-brakes, and dangerous precipices. 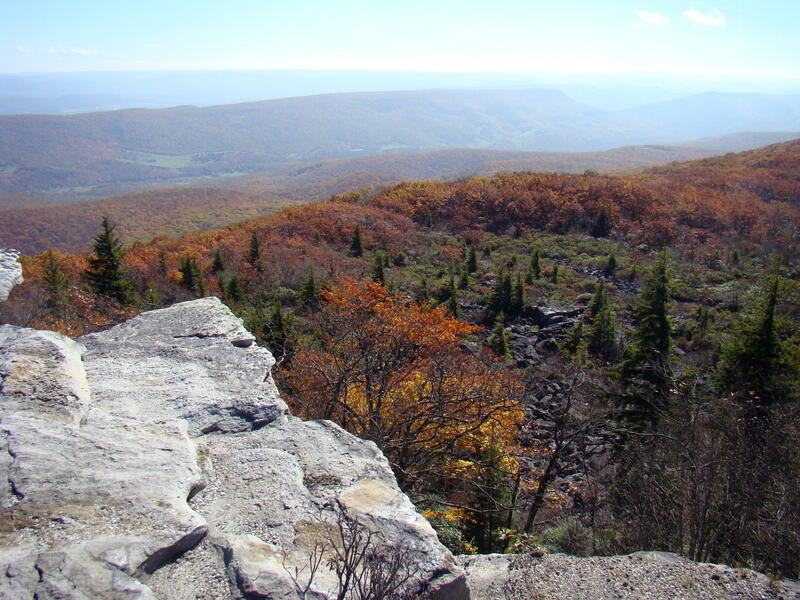 At one point in time, a glacier covered the top of Dolly Sods. Walking the trail to Bear Rock, water lays on top of the ground since it can’t be absorbed by the rocks just below the surface. The trail required careful steps to avoid too much water, and it became very narrow between the low growth of wild blueberry bushes. But in just a little while, the trail turned into one made of rocks and it was a game of hopping from rock to rock to reach the edge. An interesting sidenote was the fact that the US Army used this area as an artillery training ground before troops were sent to Europe in World War II. Hard to tell what might be found in the rocks and brush. Many seem to enjoy escaping to the world of nature. 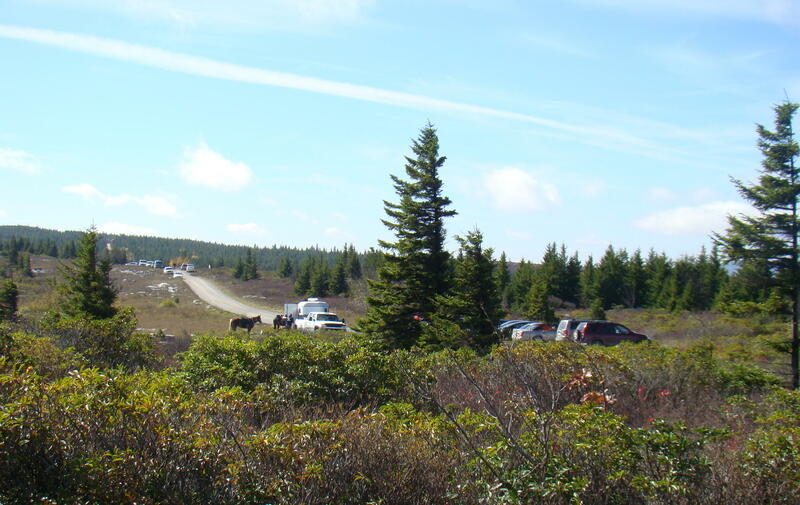 Starting back to the parking lot, it was surprising to see how many people were out walking the Dolly Sods on a weekday at a temperature of 49. Had to wonder how they found it! From Canaan Valley follow WV 32 south to the Laneville Road (WV 45). Turn left and go approximately 6 miles to the Red Creek Bridge, where the road changes from pavement to gravel and is now Forest Road 19. Every little corner of West Virginia seems to have a beautiful mountain view, and nobody does Autumn better than West Virginia. 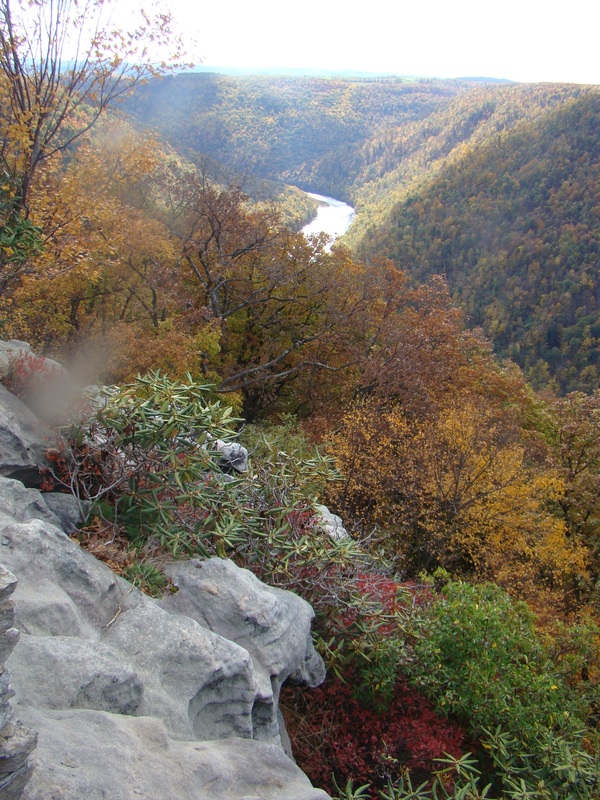 Lindy Point near Davis, West Virginia, provides a dynamic view in several directions. Heading back a narrow curving road only wide enough for one vehicle, it seems obvious that this is not a heavily traveled area even for tourists. 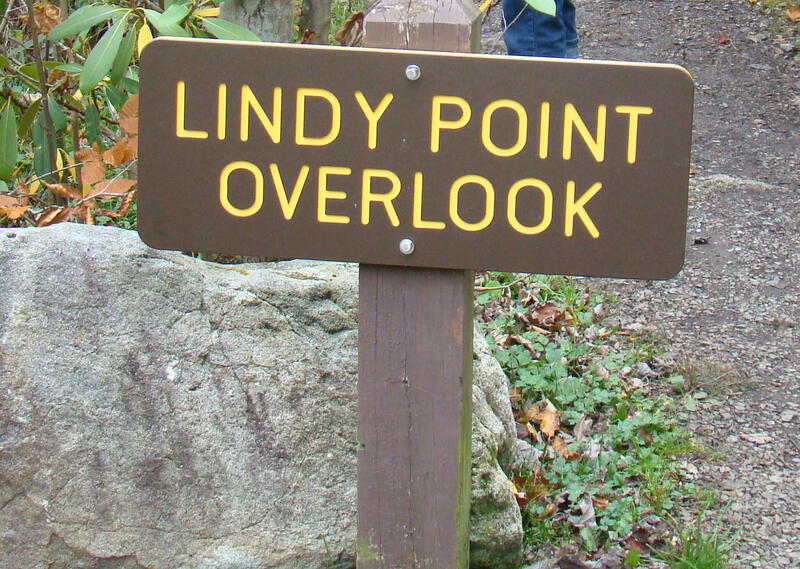 There are only four parking places at the entrance to Lindy Point so it would appear they don’t expect many visitors, but surprisingly several people were met on the trail. Traveling down a long, secluded path, each step needs to be taken carefully. 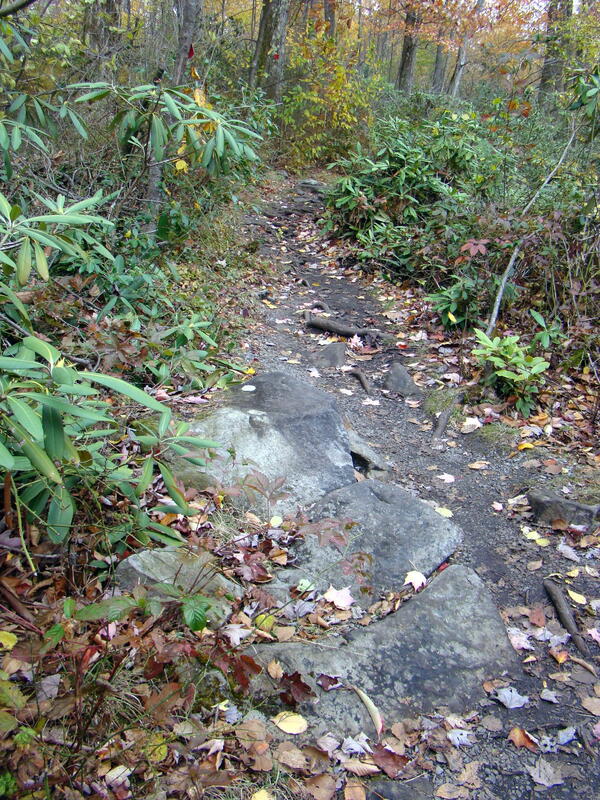 Many tree branches, briers, and rocks appear on the path, which is basically a black dirt trail, but rather level. There are interesting plants along the way as the trail leads through dense rhododendron bushes. While eyes were open for animals, especially bears, none were spotted. At places the road was muddy from rains of the past few days, and the black dirt trail turned into a boggy black adventure. There were places where there was no way around due to the heavy brush, so the only way to proceed was to walk right over the murky black bog. This was accomplished by placing the foot flat on top of the mud, one step at a time, and you didn’t sink in…well, at least not too much. A walking stick on this trail was particularly useful and welcome. Finally we reached the end of the trail to a magnificent view from the overlook. 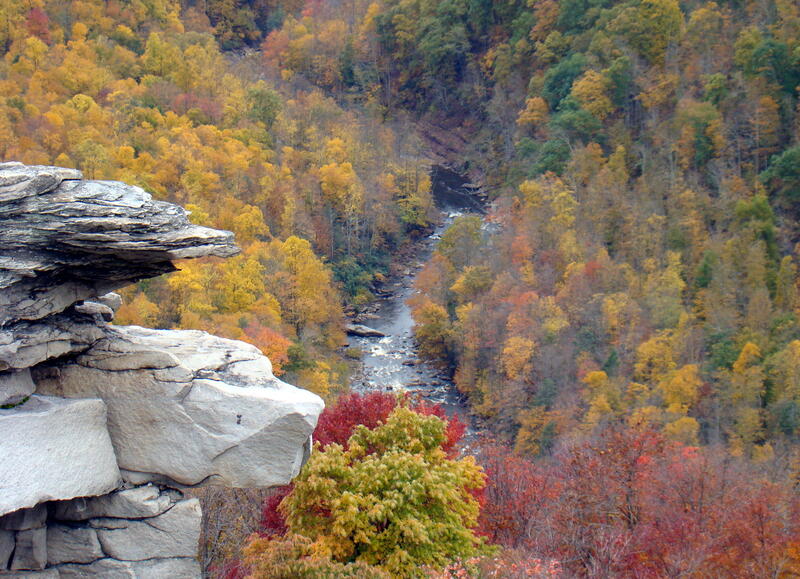 Here you can see 48 acres of the Blackwater Canyon, one of those picture postcard views in all directions, as the valley is ignited with the colors of Autumn leaves. The Blackwater River runs through the bottom, while at the top are unusual, free-standing, rock “chimneys”, which add to the spectacular view. These enormous rocks were pushed up during the formation of the mountains many years ago. A young man and his family appeared at the summit and told of his teenage adventures there for frequent picnics. He remembered the time they were having a party out on the rocks before the platforms were built. One of his friends had too much to drink and fell to his death off the rock into the canyon below. The area was closed for a couple years and then the platform was put in place as a safety measure. The walk back seemed much shorter and faster, but at the end it was necessary to clean the boggy mud off our shoes before moving on. Autumn is a great time to catch the view from Lindy Point. Anytime is beautiful, but the colors of the leaves highlighted its beauty. Directions to Blackwater State Park travel many scenic routes along the way. These are the clearest directions I have found: Take I-7o E to I-79 S. Stay on I-79 S to Morgantown, WV. At Morgantown, follow I-68 E to Rt. 42 S, Friendsville, MD. Follow to Rt. 219 S through Oakland, MD, to Thomas, WV. At Thomas, take Rt. 32 S to Davis, WV. See what I mean?